“We all affect one another profoundly,” reflects actor Brandon Galford (who played Eddie Reed) during a post-show panel discussion with the writer/director Gregg D. Garner and the cast of MENTAL. We’ve all heard it said many ways before, but so often, the consequences of what we know to be true take us by surprise when we watch them unfold. 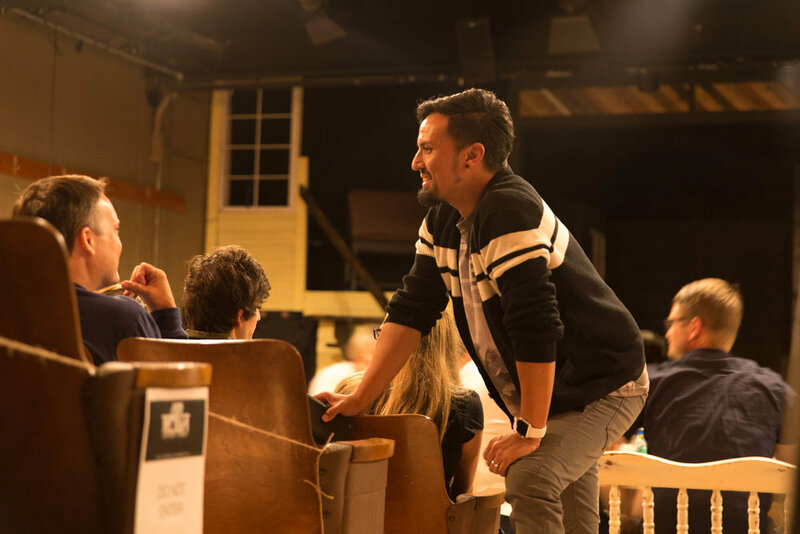 The theme of interconnectedness is disturbingly present in the play, as each scene peels back the layers to reveal how and why the Clarks came to be who and where they are. What we see in them is a reflection of what’s in many of us and in those we love - a complex blend of love and pain, a desire to be known and understood, all taking place beneath the facade of how we want others to perceive us. The Clark siblings give consistent comic relief in the midst of their hard-to-swallow childhood experiences referenced via creative flashbacks. Having seen (and loved) MENTAL when it debuted in 2016, I enjoyed watching each character take form on stage in this incredible cast, some new and some returning. In the role of Amy, actress Kim Roberts owned the task of portraying this multi-dimensional character who scorns hypocrisy and secrets, but struggles to find a way to live with both. The unapologetically human characters highlight the many, and often self-destructive, ways that we manage our own inner turmoil and navigate our interpersonal relationships. The perspectives are framed by the narrative that the Clark children inherited from their parents. In the words of the eldest daughter Amy, their mother’s “turbulent presence” and their father’s “sterile absence” became a part of who they are. One of the more haunting moments in the show is when Amy steps down to center stage and laments that she was unable to enjoy and appreciate others for who they were, because she was waiting for who they were supposed to be to arrive. She provokes the audience to evaluate whether we’re actually listening to someone, or just waiting to hear what we want them to say. MENTAL Writer and Director Gregg Garner dialogues with audience members about the play's message. While the play itself doesn’t claim to have the answers, it provides an invaluable platform for dialogue, specifically concerning the issue of mental health. Although there certainly is legitimacy to mental health issues and the services of skilled mental health professionals, the idea that one person is known as “okay” or “normal,” and someone else who is labeled with a mental illness is “abnormal” or “not okay,” is a fallacy. Such a mode of thinking can even further compound damage by making others feel bad about what they’re enduring. MENTAL reminds us that not one of us is far off from losing our footing. As Gregg D. Garner wrote in the playbill, “we are all one steering wheel jerk away from crazy.” Life is too unpredictable and fragile for us to be hypocritical. What we need when we’re suffering is the loving and authentic support of others in our lives. 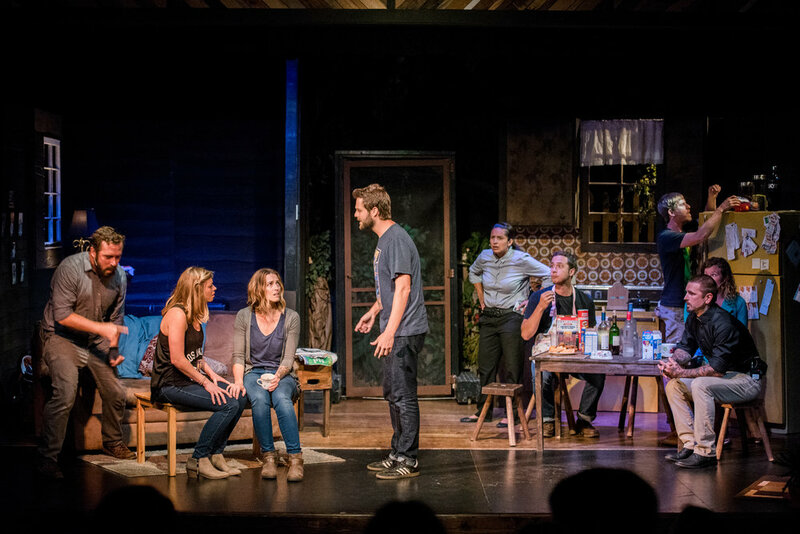 The four Clark siblings (left) and their various friends, significant others, detectives and neighbors share the stage, all of them affected by the "dysfunctional functionality" of family dynamics. As I watched MENTAL, I nearly forgot that I was an audience member in a theater, and I began to feel like I was just a guest in the Clark’s living room. Thanks to the artistic genius of this production, the story of the Clark family becomes the story of everyone’s family. Everyone who watches it could resonate with at least one character. Even if your family escaped the parts of life that make you mental, you get involved in some other way: you marry in, you befriend, you counsel, you analyze, you witness. In the end, you wonder who is more mental, the one who grew up with an unconventional mother and absent father, or the one who has no tolerance for such a situation. Their narrative, played out with skill and in dramatic form on stage, asks us to slow down, stop judging others, and listen. It’s an invitation to be genuine and stop pretending. You’re not fooling anyone.